I love my bags and I am especially partial towards leather bags because a good leather bag can last a long long time and stay looking good… if you care for it properly. Here’s 5 tips on how I care for my leather bags – high end and low end. Do not wait until they look dirty before cleaning your leather bags. I clean mine once every 2 weeks if I’m using the same bag for the whole duration. Otherwise, I clean them and air them just before storing them. Cleaning it often means you are cleaning off dirt and when you polish it or moisturize, you are helping to prevent dirt from sticking to it. I use a soft old cotton T-shirt to clean my bags or a microfibre cloth – key word : Soft. You don’t want your precious leather bag scratched. When you buy your new bag, have you wondered why its always full of stuffing? Do you get irritated with all the wads of paper in it? The answer is so that it holds its shape while being stored. You can do the same at home either with the same stuffing that came from the store or you can stuff it with old T-shirts or towels or even bubble wrap. This way, your bags will hold up well and you will not have those awful creases you sometimes get in improperly stored bags. Yes bags can take up a lot of space when storing but please resist the urge to stuff as many bags as you can in one space. You risk creasing the leather and a creased leather bag isn’t pretty. This is especially true if its a structured leather bag – once it bends or there is a crease its gone. So store them nicely, standing up where possible. It makes it easy for you to find your bag of choice too! Can you waterproof your leather bag? You can also waterproof your leather bags by spraying a water repellent on them e.g. Scotchguard by 3M which is easily found in most supermarkets. I used to scotchguard my leather shoes, with ScotchGuard or any water repellent – it really works! Rain water just rolls right off without seeping in. But I’d only do this with dark coloured shoes and similarly with dark coloured leather bags because water repellents can stain the leather and turn it a darker shade or change color totally. So, before you do anything to your bags or shoes, be sure to check on a small spot first before spraying your whole bag and then regretting it later. So, I do not scotchguard my bags at all – I value their bright colours too much! Hi dear, thanks for the great tips! Just a question, for cleaning the leather, does it matter if my bag is those light coloured ones? I have a MCM medium handbag in a light colour.. what other cheaper alternative do you use if we do not have the Coach Leather moisturiser? Appreciate your reply. Thanks!!! Light coloured leather can stain and marks are generally harder to remove, from experience. I personally use a leather cleaner by Amway if not using the Coach leather cleaner, which works well too as I also use it to clean leather furniture. I think you could use any leather cleaner for shoes or furniture, but test on a corner first to make sure it’s ok for your bag. 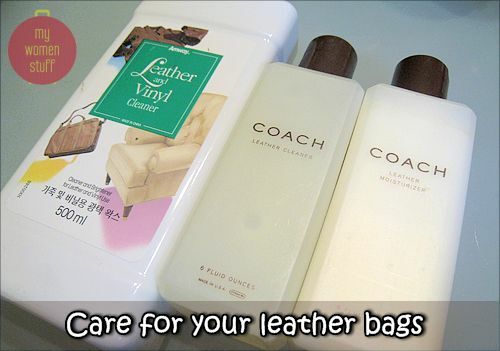 If possible, get a leather moisturiser too to use after cleaning. My MCM has color stains from this navy suede jacket i wore last night and i was just wondering did yours ever come clean ? Thanks in advance for any help or tips you can offer ! Hi. My carlo rino bag got stained by the colour from my cloth. Its very stubborn i dont know what else to do.Is there any other way other than getting the leather cleaner? Thank you very much for feedback! Generally, I’m afraid if it’s colour transfer, leather cleaner will not get it out. I normally clean my leather bag with a slight damp cloth then wipe dry with another piece of cloth, aired it for 10 mins then conditioned with Braun Buffel leather cream and finished with waterproof spray by BB as well. Both items cost around arm 30 (each)!